J. P. Beaumont's teenaged daughter has run off. Her tracks lead to the Oregon Shakespeare Festival and a case of murder. I drive a lot, and listening to books makes the time go very quickly. I am a huge fan of J.P. Beaumont. I am listening to each book in order. I like how the characters are built from book to book. This one has a great plot, and Gene Engene's narration is so good. He makes the characters come alive. My favorite author has given me years of wonderful stories. I have read or listened to all of the Joanna Brady series and now working on J.P. Beaumont. Looking forward to the next book! I like the closure for the other side plots. I also enjoy the more life-mimiccing struggles Beau faces. Another excellent J. A. Jance book! Where does Failure to Appear rank among all the audiobooks you’ve listened to so far? Definitely among the top few. All of J. 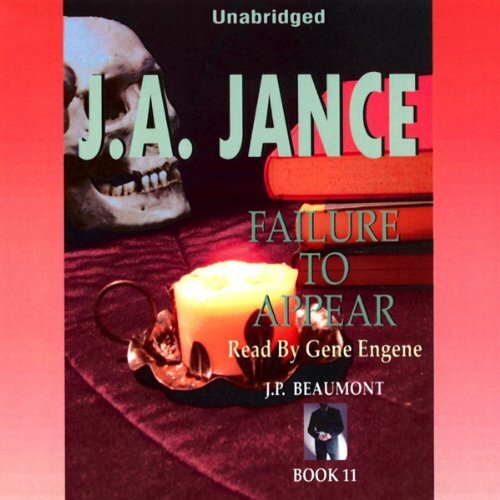 A. Jance's books are intelligently written. I have never been able to guess the killer or the ending. Have you listened to any of Gene Engene’s other performances before? How does this one compare? Yes, several. Gene IS J. P. Beaumont! Always will be. Yes! I had to break to go to bed, but continued listening as soon as I could the next morning. I get involved with the characters, I know them, I feel a part of their world. I'm from the Seattle area and love to hear references to real places that I know about or have visited. The rating of 4 for the overall category is only because the recording had background noises that sounded like shuffling papers and even people's voices. Annoying and distracting. Ms. Jance's writing and Gene's reading is a great combination! I'm really enjoying this series, but this was the most disappointing one for me. Beau made some decisions that just didn't make sense to me. It wasn't awful, but just wondered why he made several decisions that just didn't follow suit for me. He's grown on me and I really like him, it would be hard to hear anyone else read as Beau - he does a good job. Yes - but not going to give anything away. What did you love best about Failure to Appear? I would have thought by now Gene Eugene would have found a cure for his stomach problems. Listening to him trying to cover the burps and stomach rumbling gets a bit annoying. He still rattles papers and mispronounces words. Oh well. He is the voice of JP Beaumont. Im loving this series of books, getting to know the characters is key to me. This is one of my favourites so far. I have to admit that I think I'm a little in love with this gravel voiced man, i suffer from Tinitus, so i listen to parts of the book i have heard before, I don't need to concentrateon the story, and they really help me to sleep. Thank-you Gene Engene! a couple of this series have being a bit slow BUT i think getting to know everyone helps, now I'm hooked and need to know how things pan out in the characters lives.